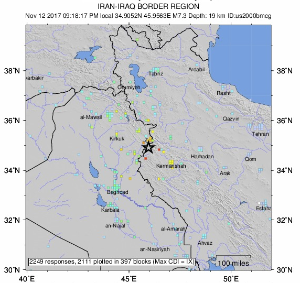 On November 12, a powerful earthquake struck the Iran-Iraq border, just inside Iran near the town of Sarpol-e Zahab. It had a magnitude of 7.3 on the Richter scale. Buildings crumbled, homes collapsed, and some villages were wiped out. Over 500 people have died, and over 800 have been injured.